Waldmann Lighting is a privately held corporation with over 950 employees worldwide and annual sales exceeding $130 million. The family owned corporation “saw the light of day” 60 years ago in Schwenningen, Germany, where it is still headquartered. The company maintains subsidiaries in France, Switzerland, Austria, Italy, Singapore and the U.S.
Waldmann’s U.S. subsidiary, located on a five-acre site in Wheeling, Ill., was established in 1982. Since its inception, the subsidiary has experienced a substantial annual growth rate. In 1996, an 18,000 square foot facility expansion was completed, increasing the production, warehouse and assembly plant to 30,000 square feet. Today, most products sold in North America are assembled and inventoried at this plant. Waldman uses several channels of distribution, depending on the products and associated markets. These various distribution layers require the maintenance of highly detailed records. Waldmann sells its machine tool, magnification, and medical task lights through distributors that specialize in either the metalworking machine, electronics or medical markets. In addition, the company works directly with OEM customers, such as machine tool builders, workstation manufacturers, and lab furniture builders. Waldmann sells its office task lights through North American contract furniture dealers. The company’s Derungs Division has the responsibility for manufacturing and marketing task lighting and magnifiers for physicians, hospital rooms, minor surgery, dental and ophthalmic exams, veterinary applications, cosmetology, and general laboratory use. In addition, Waldmann offers durable lighting arms, which it sells primarily on an OEM basis. Schaefer hired a consultant to determine the best software fit. 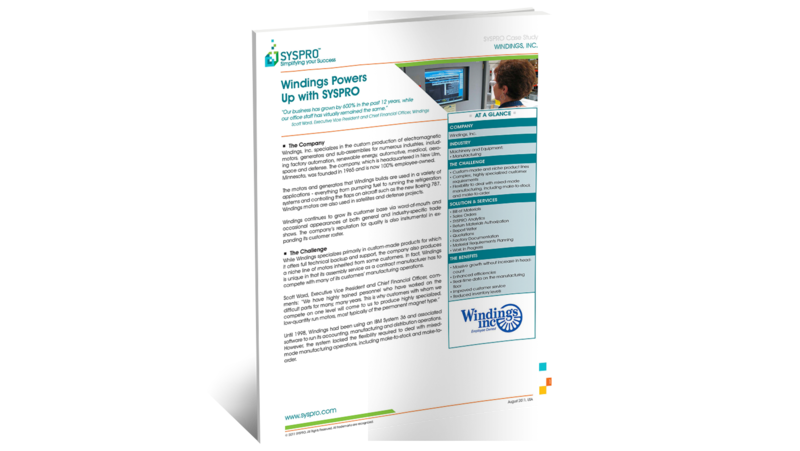 After an extensive search the choice was SYSPRO, an enterprise business software solution from SYSPRO USA. One of the factors prompting the choice was the proximity and technical knowledge of SYSPRO Value Added Reseller, Business Technology Partners (BTP). In fact, notes Schaefer, BTP not only facilitated the implementation of the SYSPRO solution, but also assisted in automating and coordinating various business processes to leverage the full advantages of the new software. Because SYSPRO is a modular system, BTP assisted Waldmann in selecting those modules fundamental to Waldmann’s objectives. BTP suggested the addition of SYSPRO ODBC to extend the functionality of the system and solve a long-standing problem – that of keeping field sales personnel abreast of changes in customer status. ODBC allows third party programs to access the SYSPRO database on a read and/or write basis. Today, BTP uses a combination of Crystal Reports and Microsoft Access for an automated system that forwards updated reports to the field via email on a daily and monthly basis. The reports, consisting of copies of invoices, credit reports, sales details and monthly recaps, alerts the sales force to the current status of customers. Prior to the automated process, invoices and credit reports had to be physically copied, a time consuming and often neglected process. By automating the process, sales personnel get timely customer information, and Waldmann customer service representatives, freed from answering sales force inquiries, can devote more time to taking care of customers. BTP also recommended the addition of another SYSPRO module, Barcode for SYSPRO, to track both labor and warehouse bin transfers. A critical problem at Waldmann was tracking the whereabouts of parts in the warehouse due to elapsed time between the issuing and recording of warehouse bin transfer tickets. By implementing Barcode for SYSPRO, transfers are now scanned in and captured in real-time resulting in the accurate tracking of all parts. Additionally, workers on the assembly floor can now log in and out of jobs by scanning their badges. Again, the real-time feedback of information into the SYSPRO database provides Waldmann office personnel with complete visibility into the status of jobs on the assembly floor.